Win the complex sale and own this business bestseller today! Joshua Peters is a salesman in crisis – after losing a key deal his boss threatens him with the sack and he has doubts concerning his choice of career. His father is a sales veteran who progressed all the way to CEO but with their relationship is at an all time low and he struggles to help. Then a mentor’s invitation from the other side of the world powerfully transforms everything as Joshua embarks on the journey of discovering leadership secrets of strategic selling. 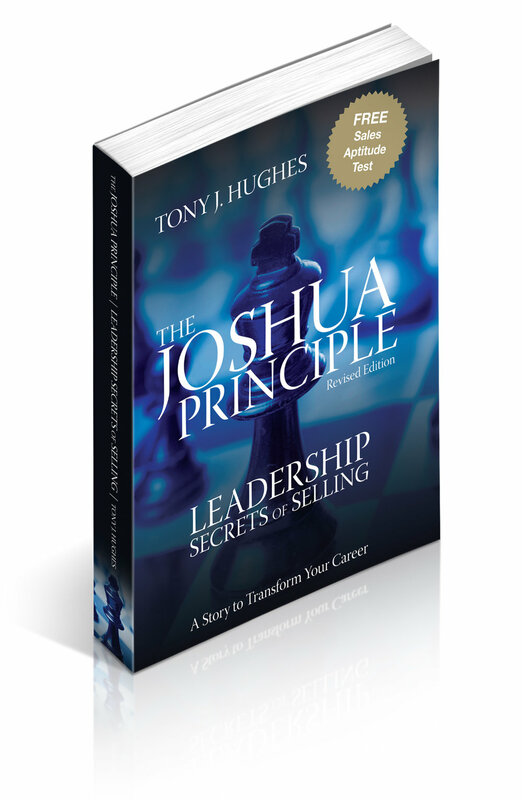 He applies the principles to the biggest and most complex deal of his life and his mentorship culminates with a powerful meeting that finally reveals The Joshua Principle. Learn about the Value Quadrant for Professional Sales Agents©, The New ROI©, the seven sins of selling, the ten laws of relationship and strategic selling, how to develop and execute effective strategy, the history and evolution of professional selling, how to gain insight to challenge thinking and create business value, how to successfully sell at the top, and much more. — Professor Neil Rackham. Creator of SPIN Selling. Listen to this short interview where Anthony Iannarino (from The Sales Blog) and Tony discuss concepts in the book. — CEO who read the book and subsequently purchased copies for the entire management team and sales organization. Ever wanted to fire your boss? Here's how if you're brave enough! Michael Blunt is a bully Sales Manager and his star sales person (Joshua Peters) finally has his day of revenge. Matt Willis plays Michael and is the most in-demand voice artist in Australia (radio advertising and Channel 7) along with The Discovery Channel throughout Asia. Joel Phillips plays Joshua and is also a professional actor and presenter. Joel did all the post production and he is an amazingly talented singer and song-writer. I highly recommend both Matt and Joel if you are looking for anything creative with high quality. — Tom Snyder: White House staff and CEO of Huthwaite. – Andrew Everingham, Public Relations Director, Salesforce APAC. – Brett Shields Senior Sales Executive, Hummingbird Corporation. – Brian Pereira, Head of Japan and Asia-Pacific, HCL-AXON. – Paul Sparks, Principal, Sales Effectiveness Australasia. – Simon Tate, Sales Director, Australia and New Zealand, EMC Software. – Anthony Howard, CEO, Asia Pacific, Merryck & Co.
– Blair Whitehead, CEO, ProGrad. – Mike Ross, Country Manager, New Zealand, Objective Corporation Limited. – Paul Wray, Senior Sales Executive, Oracle Corporation. – Greg Mennie, Senior Sales Executive,Open Text Corporation. – Paul Floro, Senior Sales Representative, IBM. – Elias Diamantopoulos, Vice President of Sales and Operations, Hummingbird Corporation. – Stephen Walker, Managing Director, Australia and New Zealand, Interwoven. – Eric Haynor, Vice President, Supply Chain Asia-Pacific, Ecolab. – Matt Loop, Vice President, Corporate Sales – ANZ, Salesforce. – John Dean,Principal, Katalyst Consulting. – Tim Cavill, Managing Director, Orange Business Services (France Telecom).